The Domain Group reports that Melbourne property listings are running at about five per cent below the stock levels of 2017 so far this year. Buyers have had less choice throughout the cooler Winter months, particularly during the school holiday period. Despite a tightening of supply, buyers have been wary of paying too much for property and in many cases are constrained on what they can spend due to the widening clampdown on mortgage lending. This has been illustrated by lower auction clearance rates compared to last year and relatively lower levels of enquiry. So if you are considering buying, now is your opportunity. We have seen real estate circles like this before (2008/2011), where buyers have tried to pick the bottom of the market and outsmart themselves. Particularly if you are upsizing on your property, now is the best climate to take action. Low interest rates, strong employment growth and strong population growth continue to be a positive foundation for the housing market. AMP chief economist Shane Oliver believes that some parts of the Melbourne market may hold up better than others going into 2019. Melbourne’s outer perimeter, for example, continues to grow. The REIV reports that the median prices for both houses and units have risen over 10.5 per cent from a year ago. REIV President, Richard Simpson notes that, “auctions continue to be popular all over Melbourne, but clearance rates have fallen from the lofty highs of early 2017. Negative chatter about the future of the sector coupled with stronger lending controls by financial institutions has created some uncertainty and vendors need to be realistic with their price expectations”. This is an important reminder, particularly as we should see an increase in stock levels in late Winter and as we move into the peak Spring selling season. If you would like a complimentary appraisal of your home or simply wish to chat about the market, give me a call on 0403 020 404. If you missed it last night, here is my appearance on Look At Property. I was on the panel, discussing the impact of international buyers in Australia as well as when is a good time to buy or sell property. If you would like to discuss either topic further, please do not hesitate to contact me. In this week’s edition of The Weekly Review, Mal James talks about the improvement in auction clearance rates across Melbourne last weekend. 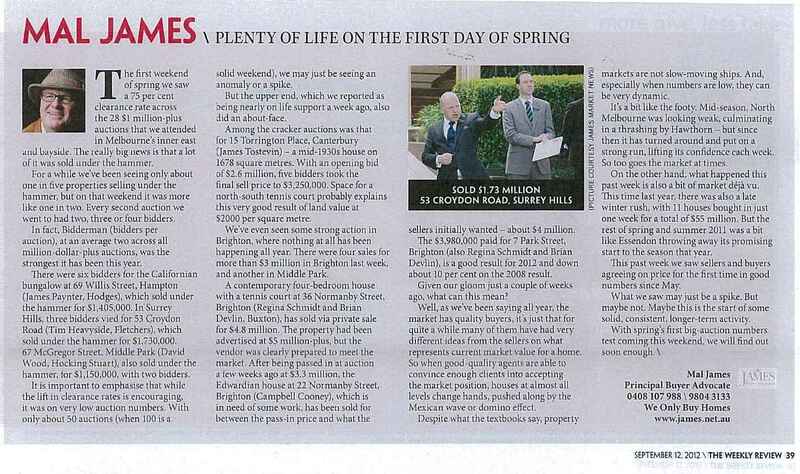 He also mentions our excellent auction result at 53 Croydon Rd, Surrey Hills, plus an “action shot” of me in full auction mode.